I’m not really keeping up with my food news. 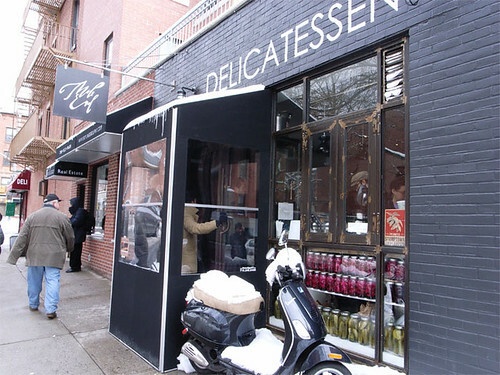 I had no idea Mile End, a Montreal Jewish Delicatessen on Hoyt St, was even there AND I live so close to it! So last week I bumped into a friend at Union Hall while at the Via Audio show and he told me he had just reserved a dozen Montreal bagels from Mile End for $20. I asked him…”Huh? Where?” He told me where and that I have till noon on Friday to get them. Now I know next to nothing about bagels from Montreal except there are big debates on the web comparing bagels from NYC and Montreal. I do know that a fresh baked bagel with veggie cream cheese is a pretty damn good thing. But a not so fresh bagel tires my jaw so quickly. On Saturday after lazily waking up and got dressed, I walked over to Mile End to pick up my dozen bagels, half poppy seed and half sesame seed. At 10:30am the place was packed, though the place was tiny. I would like to go there, grab a seat at the counter and have a proper meal there. Anyways back to the bagels. 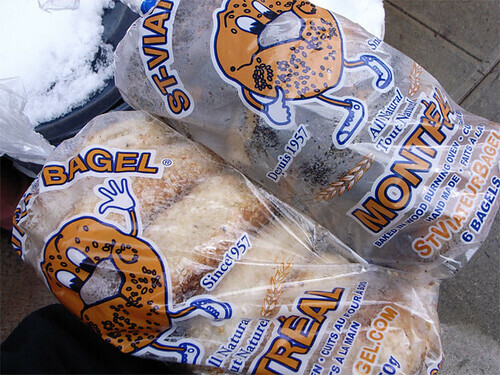 People from Montreal rave about how good their bagels are. I do agree with them on some points. The St-Viateur bagels were denser which made it very easy to slice in half. Plus. The bagels were smaller and thinner which meant less room for cream cheese. But here’s the 1 reason why I still prefer NYC bagels over Montreal bagels, taste. After having eaten 2 on Saturday and 1 on Sunday I have concluded that there was no flavors in the Montreal bagels at all. I can’t even say it was bland, it had no flavors whatsoever. Even after toasting it a bit, there was just nothing. The sesame seeds had no flavors in them as well! WTF? Both Mo and Matt agreed that these bagels weren’t that great, so it wasn’t just me. BUT my friend that told me about these bagels loved them and found the bagels to have great flavors. So…..I don’t know. I’m not gonna give up on these bagels just yet, not until I had a proper 1 from Montreal in Montreal. But if you REALLY want a dozen St-Viateur bagels go and order from Mile End.